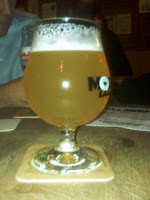 After a long week, it was good to settle in at Chez Moeder Lambic St Gilles for a couple hours this evening. Even better, for company, I was joined by the "journalist from a major international newspaper who has a business card with the word 'beer' on it". And then, after a glass or two, we had a surprise tour of the cellars. 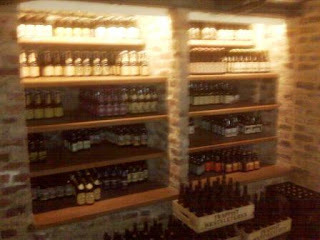 But before we go downstairs, let's review the new on-tap tastings. 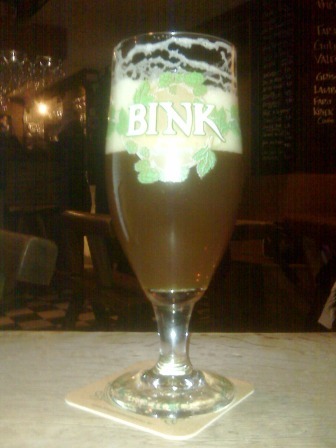 First up was Bink Bloesem, an amber beer from the Kerkom Brewery. It immediately seemed to me richer and deeper than the average Belgian amber. It poured with a big head, and its taste was honey sweet, with some of those gingerbread tastes I love so much in dark Belgian beers: nutmeg, cinnamon, even stewed plums. It was, I'd say, one of the best ambers I've had in Belgium. The second new beer was Re-Hop, which hails from south of here a bit. No, I don't mean Wallonia. Actually, it's made by the Toccalmatto Brewery in Fidenza, near Parma, Italy. OK, I have to admit my prejudices here. I was not expecting much from an Italian beer. My experiences with the brews of that country, which is otherwise perfect in every other culinary way, are limited to dull pilsner wannabes. 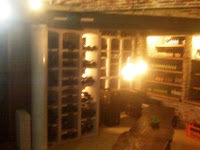 But if Chez Moeder Lambic is offering it, I figured, it can't be bad. Indeed, that logic proved correct. Re-Hop is a lovely top-fermented ale, with a firm hop and lemon flavour, undisturbed by its relatively low carbonation. The brewery's website says it's: "Excellent as an aperitif or in combination with pizzas and focaccia with grilled meats, etc." That is very easy to imagine, and, well, mouth-watering.